What do Cloud Service Providers Mean by On-Demand Cloud Computing? Although the term ‘on-demand’ is linked with many different types of technology, the interpretationthe service remains mostly the same – to access what you want, when you want it. Within the world of Amazon Web Services (AWS), an on-demand cloud would either be associated with one of the three EC2 pricing structures offered by Amazon, or as a specialised feature provided by an AWS cost reduction tool. Out of the three pricing structures offered by AWS, the on-demand plan provides I.T teams with the mobility to spin-up servers immediately when needed and pay for EC2 capacity by the hour – so users only pay for what they use. In this respect, Amazon’s delivery of EC2 functionality clearly produces the immediacy that users expect from an on-demand service. But more often than not, after a period of prolonged usage and uncoordinated management, EC2 costs can incrementally increase when servers aren’t switched off properly. This prompts many businesses to consider the use of AWS cost reduction tools which can switch Amazon EC2 Servers ‘On’ and ‘Off’ when needed, to lower AWS bills and provide more budgeting resources for I.T teams. 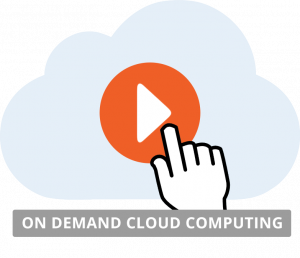 It’s at this point when the understanding of what ‘on-demand’ means starts to blur when compared against terms such as ‘automation’, creating some confusion with customers on what to expect from on demand cloud computing. Many AWS cost-saving solutions often allude to features similar in functionality to on-demand, but do so through less than clear and unambiguous product descriptions. On a first read-through you probably won’t notice anything wrong with these descriptions, but on closer inspection, we can see that they’ve been carefully worded to emphasize the impression of ‘on-demand’ capabilities. What do we mean? Well, they may not say on-demand directly, but if you look at these sentences again you’ll probably notice that the term ‘automatically/automate’ has been used several times across them. This in turn creates an expectation with the reader that an automated action is likely to produce an immediate or sharpish response. For example, we often associate the term of ‘automatic’ with that of a functioning automatic door – it opens immediately when needed. However, in the case of many cost-saving server tools, ‘automate’ simply means to implement a server schedule or threshold that will ‘automatically’ control when a server switches on/off – at another point in time. Which means that the promise of “Start and stop EC2 instances – only when you need them” is actually a misrepresentation and technically misleading. So in comparison, while the term ‘Automatically’ means to trigger an on/off response to a predetermined event, ‘On Demand’ control looks to provide an immediate response to an unscheduled event, which can provide operators with the crucial agility to quickly stop idle servers, and lower their AWS costs as a result. True on demand cloud control from an AWS cost-saving tool should look to deliver the same functionality as Amazon’s own interpretation – an immediate response. However, while Amazon’s on-demand approach certainly does what it suggests, it does have limits on how quickly you can perform an action, and where you can perform it from. For example, because AWS is usually accessed through a browser on a work computer, you’d still need to be sat at the desk in the office before you could spin-up any servers for the day’s work ahead. You could argue that by using a smartphone web-browser you could navigate around this issue and access AWS – and technically you’re correct. But given the small screen and inaccuracy of a touch screen on the move, it’s certainly not a solution conductive for quick and easy AWS access. It also doesn’t really support the proposition of on-demand immediacy. As such, the next step for on-demand control would be to utilise an app that can boot-up servers quickly and easily, so users don’t have to wait to access the main AWS console before they can work. So for team members travelling on business, giving remote demonstrations, or staff in different time zones, having a way to remotely start EC2 servers without being at your desk could prove invaluable. When fully realised, true real-time ‘on-demand’ control like the feature offered by Cloud Machine Manager and its Mobile Starter App (iOS and Android ready) allows users to dynamically switch their Amazon EC2 servers ‘On’ or Off’ with the press of a button…and not worry about large server bills mounting up!